Cbus and HESTA, with Maurice Blackburn, are bringing the Fearless Girl statue to Melbourne in a salute to equality and diversity. 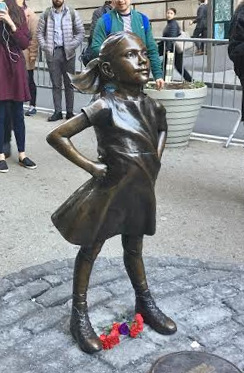 The bronze statue has been standing on Wall Street in New York City facing down the Charging Bull, originally commissioned by State Street Global Advisors in 2017 for International Women’s Day. We’ll have the Fearless Girl for two years, in Federation Square, before she moves to a more permanent home in the Melbourne CBD. International Women’s Day is on 8 March 2019. Andrea Slattery is the newest non-executive director to join the AMP board. Slattery has over 25 years’ experience in financial services, superannuation and retirement industries, founding and leading the SMSF Association. Marsha Beck is to fill the newly-created role of managing director of Australia. Beck moves into the role from leading AMP Capital’s global consultant and account management strategy for Asia-Pacific’s client division. Michael O’Brien replaces Steve Leigh, who retired, as QIC’s managing director of real estate. O’Brien was most recently chief financial officer at Vicinity Centres, a manager of listed retail property. After George Fishlock retired, Ben Firkins is to take over as chair of AvSuper. Firkins has been part of the aviation industry and is an auditor. Michael Armitage is to head up Australia’s investment consulting team in the institutional wealth team. Armitage moves across from Milliman. Natasha French’s exit from SuperConcepts is coming sooner than expected with a new appointment at another company, with an interim chief executive appointed - Adrian Urquhart. The search for a replacement continues.